Back in April, I had the opportunity to visit one of the most serene and terrestrial places on planet: the Blue Lagoon. So what exactly is this place? Well for me, it’s one of those dope places that you see on the Travel or Discovery Channel, but never think you will actually ever visit. But in reality, it’s geothermal spa and happens to be one of Iceland’s most visited attractions. Simply put, if you visit Iceland without making a stop at the Blue Lagoon, you’re doing it wrong. The lagoon is man-made and located in a lava field in Grindavík on the Reykjanes Peninsula. So how did the lagoon come into existence? Well, in 1976 a pool formed at the site from the waste water of the geothermal power plant that had just been built there. A few years later, people started bathing in it after its purported healing powers were popularized. In 1992, the Blue Lagoon company was established and the bathing facility was opened for the public for tourism. The awesome thing about the Blue Lagoon is that shuttles run regularly between Keflavik airport, the spa, and the hotels in Reykjavik. The spa is about a 20-minute drive from the airport and a 50-minute drive from Reykjavík. This is helpful for those who have an early arrival into Keflavik, but can’t check into their hotel until the late afternoon. For example, my flight arrived at 6am, but check-in for my hotel didn’t start until after 2pm. So, instead of stressing out about how I would spend the next 8 hours consuming my time, I arranged for my shuttle to drop me off at the Blue Lagoon and took a shuttle directly my hotel in Reykjavik when I was done. What a nice way to unwind after a 6 hour flight? If you’re arriving from the airport (or doing a stopover before heading back to the airport…many tourists do this as well), the spa will check your luggage for a nominal charge. The Blue Lagoon offers four standard base packages: standard, comfort, premium, and luxury. These packages increase in price and amenities. After selecting your package, you’re given an electronic wristband, which is scanned to add al a carte items such as spa treatments, drinks, lunch, etc. The wristband is also used as an electronic key for your assigned locker. In addition to swimwear, you are allowed to bring your own robe, slippers. If not, you can choose one the packages that offers these items upon check-in. After check-in, guests are REQUIRED to shower before entering the lagoon. As a nurse, I think one of the best attributes of the spa is its strict code of hygiene. After showering, and putting on your suit, you’re free the go out to the lagoon. Some people stay for a short time and others stay for hours. The lagoon has a swim up bar and I had no reservation about drinking Prosecco at 8 o’clock in the morning. I mean, I’m in Iceland! While the temperature outside was about 35 degrees, the average temperature of the lagoon averages around 99 to 102 °F. So what are the benefits of the lagoon? Well, the warm waters are rich in minerals like silica and sulfur. It’s been reputed that bathing in the lagoon helps some people suffering from skin diseases such as psoriasis. Protect your hair: the geothermal waters of the lagoon can REALLY dry out your hair. From what I’ve been told, it literally turns your hair into straw. I recommend wearing a head wrap and avoid submerging your hair into the water. Pictures: Take advange of the on-site photographers. They will take your photo free of charge and even email it to you. Purchase or bring a cell phone cover- you can use a plastic sleeve to secure your phone when you take pictures in the lagoon (unless your phone or device is waterproof). The Blue Lagoon sells these for $25.00. Silica mud mask: try it, it’s a must! There is a restaurant, hotel, and skin care shop on site. If you’re traveling on budget, the skin care products are much cheaper at the airport. Children: children under the age of 9 years old are only allowed entry with the use of armbands, which are provided free of charge, also, the lagoon is not suitable for children under the age of 2 years old. Didn’t take long for me to make friends! And yes, I look forward to returning back in April 2017. You should join me! For most of us, a small island sitting near the “Arctic” ocean and struggling to reach 50 degrees even on its warmest day may not seem like an ideal vacation destination. Usually when we think of “vacation”, we tend to envision the warmth of the sun tanning our skin, sandy beaches, cool mojitos, and lush palm trees. Thermal underwear, winter boots, and down coats, are completely off our radar. Well, allow me to open your mind and change your perspective. Iceland is a MUST for your travel bucket list. As a kid, I remember reading about Iceland in my encyclopedias. It was always one of those destinations I hoped to visit someday, but seemed well beyond my reach. So, when I learned of an upcoming meet up taking place with about 80 black travel enthusiasts like myself (later dubbed “the #icelandblackout”), I immediately jumped on board. Like my other travel adventures, I couldn’t wait to share my enthusiasm. I mean, I was going to freaking Iceland!! But when I shared the news with family and friends, their responses ranged from blank stares to phrases like “but it’s cold there you may as well stay here”… “you’re crazy”, and my personal favorite, “are there any black people there”. But once they saw the fabulous selfies of me relaxing in the celestial waters of the Blue Lagoon or me posing with a breathtaking view of the Gullfoss Waterfall as backdrop flooding their social media timelines, I went from being crazy to “who did you use to book your trip to Iceland”. When they saw my Facebook status about the city of Reykavik’s happening nightlife and dancing to hip-hop and trap music with fellow Icelanders, I went from “why are you going to Iceland” to “I CAN’T WAIT to go to Iceland”. My, how quickly people change their perceptions LOL. But seriously, I think Iceland is a destination everyone should experience at least once. Getting there is fairly easy and it’s very doable as a solo traveler or with a group. With carriers such as Icelandair offering daily non-stop service from most major US cities, getting to Iceland is fairly simple. I used this carrier and had a great experience. Icelandair allows you check up to two bags weighing 50 lbs each with no baggage fee, they provide bottled water upon boarding, offer USB ports on each seat to charge your electronic devices, offer a great selection of free movies and other programming, and comes equipped with on board wifi (for a small fee). The flight time from Chicago to Reykjavik is approximately 6 hours, so these amenities were a huge plus for me. If you live on the east or west coast or want to be more cost conscience, WOW Air also offers nonstop service to Iceland. The fares are much lower, but as a “no frills” carrier, you will miss out on most of the amenities and perks offered by Icelandair. For example, you can fly roundtrip from Baltimore, DC, or Boston for as low as $300 USD, but the baggage restrictions are very strict (your purse actually counts as your carry-on SMH). Keflavik airport is fairly easy to navigate and getting through customs is breeze. There is no entry or exit fee. Just have your passport ready and you’re good to go. After you pick up your luggage, don’t forget to stop in Keflavik’s duty free shop located across from baggage claim. I guess now is a good time to mention the downside of Iceland: basic essential items ranging from food to liquor to toiletries are VERY expensive!!! As far as getting to your hotel, you have different options. Some travelers in my meet up group chose to rent a car during their stay. But if you’re directionally challenged like myself, you can also take a shuttle. Gray Line Iceland and Flybus are the most common airport transfers and cost about $36 USD roundtrip from the airport. Another advantage to using the shuttle is that you can also arrange for drop off at the Blue Lagoon and stay for a few hours then take the shuttle to your hotel. I chose this option because my flight arrived at 6:30am and hotel check-in didn’t begin until 2:00pm. You get to have your first excursion before you even check-in. How cool is that? Iceland offers plenty of lodging options to suit every need and budget. Some tourists utilize traditional hotels, AirBnB home/apartment rentals, and hostels like Hlemmur Square. During my visit, I stayed at the Hilton Nordica Reykjavik . The hotel is modern and the staff is pretty helpful and accommodating. They offer a daily brunch buffet which cost about $30 USD. And there is also coffee and “grab and go” food served in the hotel lobby. If you want to skip on dining at the hotel all together without traveling too far, there are a few restaurants that are in very close walking distance for the hotel. They offer daily free wifi and a free bus pass during your stay. One of the biggest regrets of my visit was not exploring more of downtown Reykjavik (Iceland’s capital) and checking out the abundant street art. If you have an appreciation for street art, this is the place to be. And with its street art, this quirky town adorned with quaint shops, boutiques, cafés, and restaurants. Although I missed out my daytime stroll downtown, I did get a chance to explore the night life. After dining at the popular Cafe Haiti (which I HIGHLY recommend), my travel compadres relocated “the #icelandblackout” to one of Reykjavik’s hip-hop clubs, Prikid. Who knew Icelanders had an appreciation for Drake, Lauryn Hill, 2 Chainz, and Panda? I hadn’t danced and sweated out my hair like that since my early 20’s. Their nightlife is lit and almost reminded me of being back home and Friday night bar hopping on Rush Street. I won’t go into too much depth about the excursions, because I will be blogging about these separately. The most popular excursions are: The Blue Lagoon , The Golden Circle Tour, the South Coast, whale watching tours, glacier climbing, and chasing the wondrous Northern Lights. There’s something for everyone and you can be as adventurous (or not) as you’d like. You can book your excursions with a regular tour company (I recommend Geoiceland Day Tours). But, if you’re a little more adventurous, you can rent a car and do the Golden Circle tour or chase the Northern Lights on your own. The advantage of renting a car is that allows you to sight see on your own time. This disadvantage is that the roads can be a little difficult to navigate and you don’t have a tour guide to give you any history. If you really want to be creative, my travel group rented a party bus to chase the Northern Lights. We were unsuccessful with seeing the lights, as weather conditions must be optimal. The best time of year to see the lights is from September to around April 15th. Although we missed them, it still didn’t stop us from pulling over and dancing under the Iceland stars. Snacks/Liquor: Again, Iceland is expensive. If you like to snack and the idea of paying $5.00 for a small bag of chips doesn’t seem appealing to you, pack snacks in your luggage. And don’t forget to buy water and liquor from the duty free shop at the airport. Tipping: Tipping is not required. And I’m totally okay with that. Did I tell you Iceland is expensive? Currency: Iceland appears to be completely cashless society. There are ATMs available if you need them, but they are seriously about that chip life. You know the chips that only a small fraction of businesses are using here in the US? They are so far ahead of the game. Clothing/Packing: Please pack accordingly. If you plan on doing any outdoor excursions, you will need thermals, a down coat, and a warm hat/gloves. In April it was in the 40’s. Being from Chicago, 40 degrees is pretty tolerable. But what I didn’t consider was Iceland’s 20 degree temperature drop and high winds once travelling outside of Reykjavik. 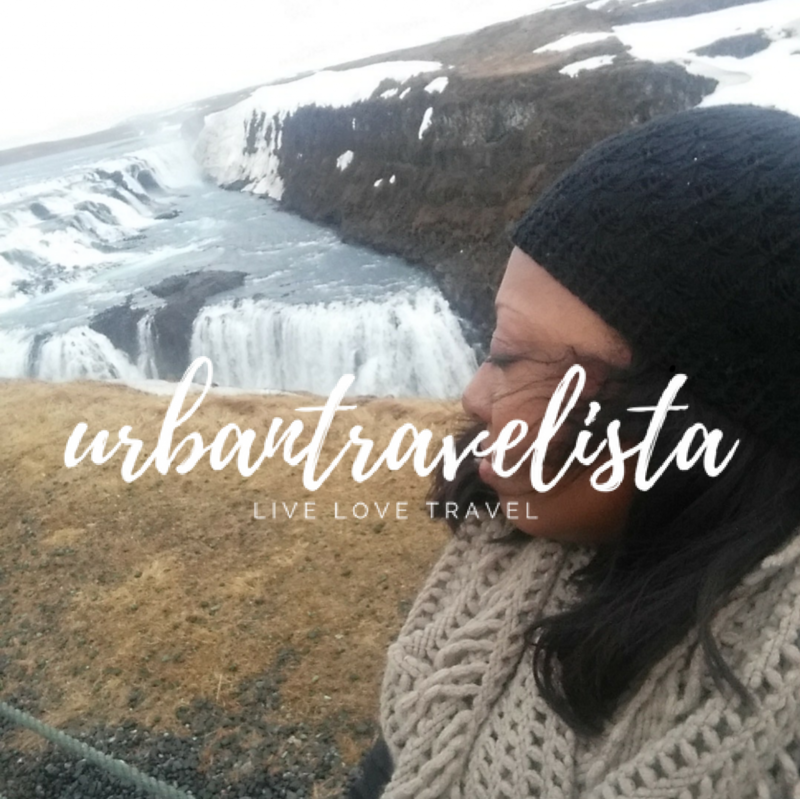 Even as a Chicagoan, I underestimated Iceland’s gangsta and nearly froze during most of the Golden Circle Tour, especially at the Gullfoss Waterfall. It was so cold that I lost a pair of gloves at the halfway point and ended up buying a $30.00 pair (the cheapest I could find) of very plain gloves to get me through the rest of the tour. So if you’re traveling during the milder months, please keep this in mind and pack accordingly. It’s better to have something and need it than to need it and not have it. Booking: This sounds like a no brainer, but when you book your hotel, please keep in mind that your check-in will be the day AFTER your departure. For example, if your flight departs Wednesday, April 27th then your check-in will be Thursday, April 28th. Believe me, I am not trying to insult your intelligence. It’s just one of those things people (including myself) don’t think about if they’re not used to travelling across several time zones. The Blue Lagoon: Book your excursion to the Blue Lagoon early. It’s one of Iceland’s most popular attractions as tourists often do short stopovers while traveling between Europe and the states. If you wait until the last minute, there may not be availability. It would be a total bummer for you to travel all the way to Iceland and not be able to book the Blue Lagoon. You will be very sad. Footwear: My biggest dilemma was deciding what type of footwear to bring. If you’re doing the Golden Circle tour, I recommend bringing boots that are waterproof and that are easy to clean if they get muddy. I almost made the mistake to bringing my Uggs. They would’ve been fine to wear in Reykjavik. But some parts of the Golden Circle are muddy and I would’ve ruined my Uggs. I recommend footwear like Sperry’s duckboots. They’re stylish, warm, and are able to withstand the elements of the tour. Travel adapter plug: The plugs of our North American appliances will not fit into an outlet in Iceland (and most foreign countries) without an adapter. A travel adapter will allow you plug in your electrical devices during your stay. You can purchase these at Best Buy, Radio Shack, Target, or online at Amazon and REI. They run between $15-20 USD. As you can see, three nights and four days still didn’t cover everything Iceland has to offer. Therefore, I’m already planning another return for next Spring. Routine travel to destinations like the Caribbean and Mexico is great and have a very needed place in our lives, especially when we need to unplug from the hustle and bustle of the rat race. But travel should occasionally to push you outside of your comfort zone. This is where the magic happens. This is how we experience” life in it’s true essence. Travel to a destination you never thought you’d be interested in or thought was possible. You might leave with more than airport souvenirs. You might leave with a broadened perspective and experience of lifetime. And no one will ever be able to that away from you.